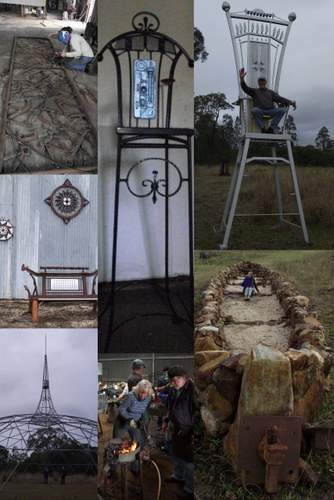 On a very rainy Saturday in August 2014, Borderline members Maggie Brockie, Sue Jurd, Michael Pieper and Jim Grasby (Jim was the blacksmith tutor) attended the Welding and Blacksmith Workshop at Keith Cameron’s Fire and Stone Sculpture Park and Arts Center at Plains Station Road, Tabulum. How inspirational! At every turn, a landscape filled with creativity met the eye and stimulated the artist/ craftsman within. The huge farm shed, with fully equipped workshop, was the venue and the 14 participants were encourage to try both the welding and blacksmithing. Results were easily achieved with the guidance of such knowledgeable tutors and the access to welders, grinders plasma cutters, forges, anvils, etc. Materials for the welding were sourced from Keith’s comprehensive and very valuable ‘junk’ heap. Keith has lived on the property for 27 years and has created an amazing array of metal and stone sculptures and constructions, including a silo, housing two floors of art gallery, with access to a roof top deck where panoramic views of the property and the Richmond Range can be seen. We were free to roam the property viewing and interacting with the giant chairs, stone enclosures, ‘musical’ sculptures, etc. Due to the rainy weather, camping over night was aborted, and the Borderliner’s enjoyed the hospitality and warm company of Keith, and his partner, artist Marion Arentz. Wood, glass and metal; Silk and metal; Clay and metal; what next for Michael, Sue and Maggie?